This dramatic borderless weaving has 28 serrated diamond medallions overlaid on the finely striped field, the top row of which has red centers, red and dark green alternating stripes, with light green stripes at the opposite end, the diamonds outlined in black, light orange, ivory, with alternating centers of creamy beige. 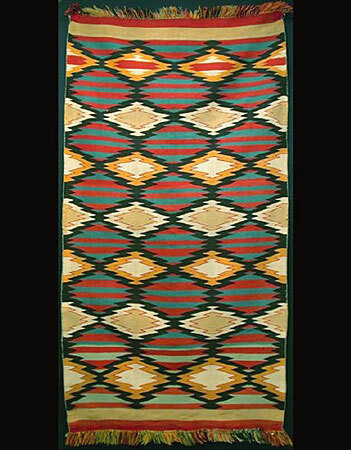 This Moki style Germantown blanket dates to the late 19th Century. Condition: The fringe is intact, there are very minor edge reweaves, and it is in overall excellent condition. Provenance: H. Malcolm Grimmer, Santa Fe NM.